Flagellin is a globular protein that arranges itself in a hollow cylinder to form the filament in a bacterial flagellum. It has a mass of about 30,000 to 60,000 daltons. 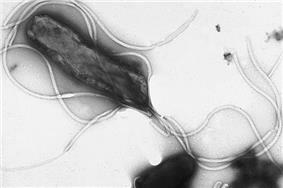 Flagellin is the principal substituent of bacterial flagellum, and is present in large amounts on nearly all flagellated bacteria. The N- and C-termini of flagellin form the inner core of the flagellin protein, and is responsible for flagellin's ability to polymerize into a filament. The middle residues make up the outer surface of the flagellar filament. While the termini of the protein are quite similar among all bacterial flagellins, the middle portion is wildly variable. Mammals often have acquired immune responses (T-cell and antibody responses) to flagellated bacterium, which occur frequently to flagellar antigens. Flagellin has also been shown to directly interact with TLR-5 on T cells. Some bacteria are able to switch between multiple flagellin genes in order to evade this response. Flagellin is an extremely abundant protein in flagellated bacteria. There exists a specific innate immune receptor that recognizes flagellin, Toll-like receptor 5 (TLR5). In addition, a 22-amino acid sequence (flg22) of the conserved N-terminal part of flagellin is known to activate plant defence mechanisms. Flagellin perception in Arabidopsis thaliana functions via the receptor-like-kinase FLS2 (flagellin-sensitive-2)). Upon flg22 detection, FLS2 quickly binds to BAK1 (BRI1-associated kinase 1) to initiate signalling by reciprocal transphosporylation of their kinase domains. Mitogen-activated-protein-kinases (MAPK) acts as downstream signalling compounds, leading ultimately to PAMP-triggered immunity in which more than 900 genes are up-/down-regulated upon flg22 treatment. ^ Sharma, N; et al. (2013). "Sphingosine-1-phosphate suppresses TLR-induced CXCL8 secretion from human T cells.". J Leukoc Biol 93 (4): 521–528.